Will the BCF be declared a criminal enterprise? According to this article in today's Boston Globe, a state commission studying the daily fantasy sports market (think: DraftKings & FanDuel) is voting on a draft report which declares that "all games played for money are illegal gambling" regardless of whether luck or skill is involved. 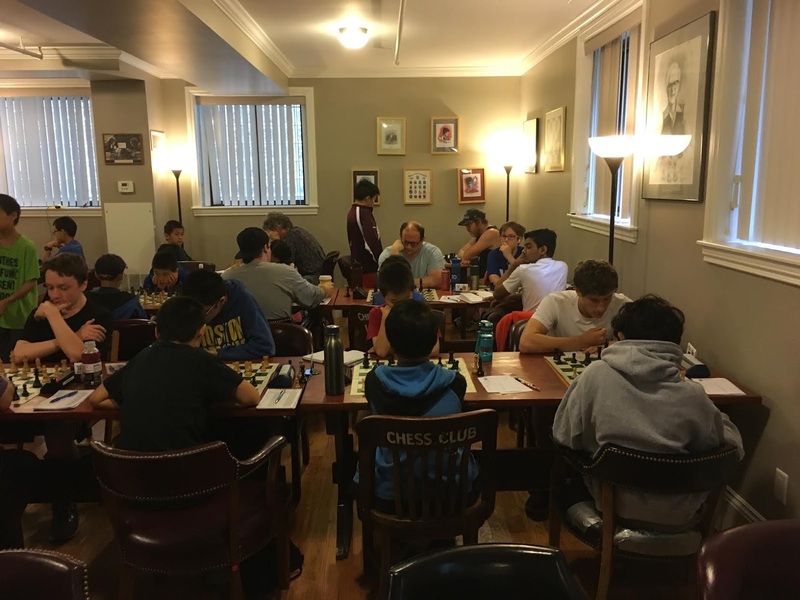 Seems as though chess tournaments would meet that definition. While I doubt the state police will be knocking down our doors anytime soon, this might be an issue worth monitoring going forward. a few brain cells still firing. Natasha Christian in Round 2.
sunlight vs Bob Oresick, Round 1. UNDER THE GAZE OF HAROLD DONDIS, ESQ. 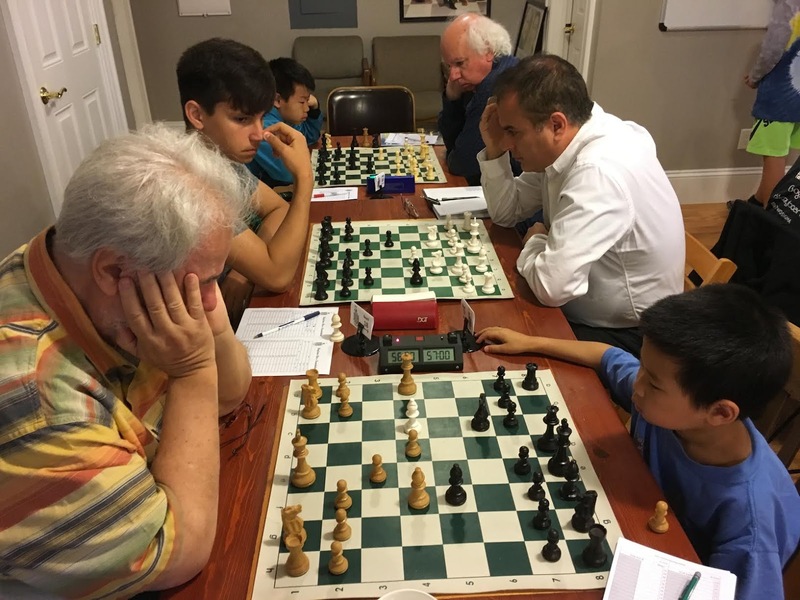 David Bird, black vs Bob Oresick: draw! 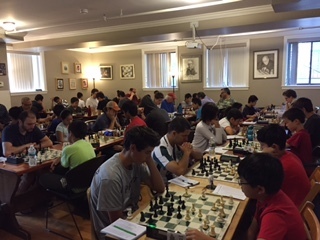 FM Steve Winer vs NM Chris Williams, Round 5.
in the event. Bravo, Steve! 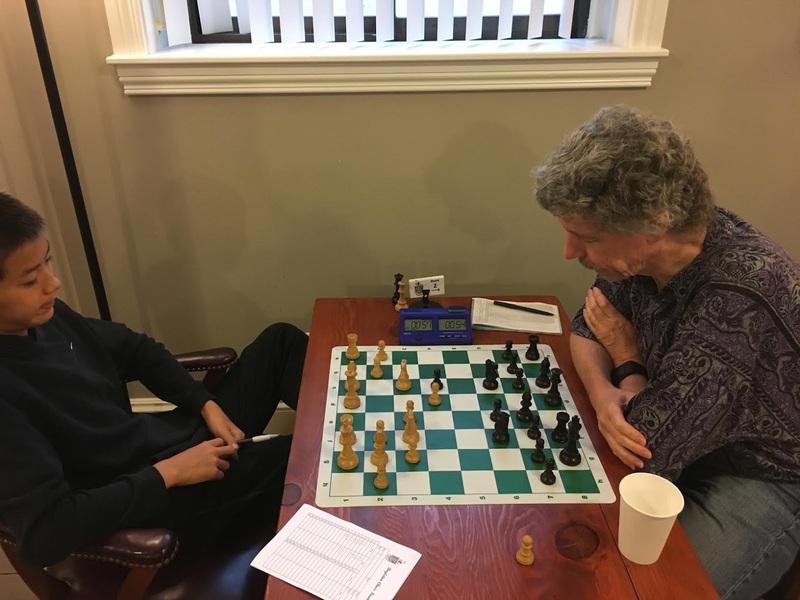 Steve Winer vs Zubin Baliga, Round 7: draw! 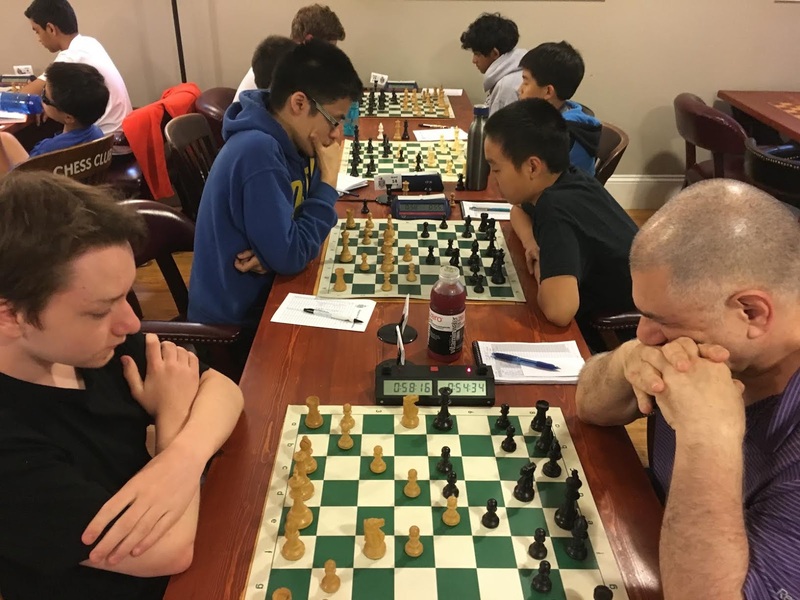 Zubin scored 4.5/7 for a +8 to 2060 rating. +6 to 2253 rating! Bravo, Farzad and Andrew! NM Chris Williams, black vs Matthew Meredith, Round 4: draw! William Schreefer, black vs Aravind Ponukumati, Round 5. 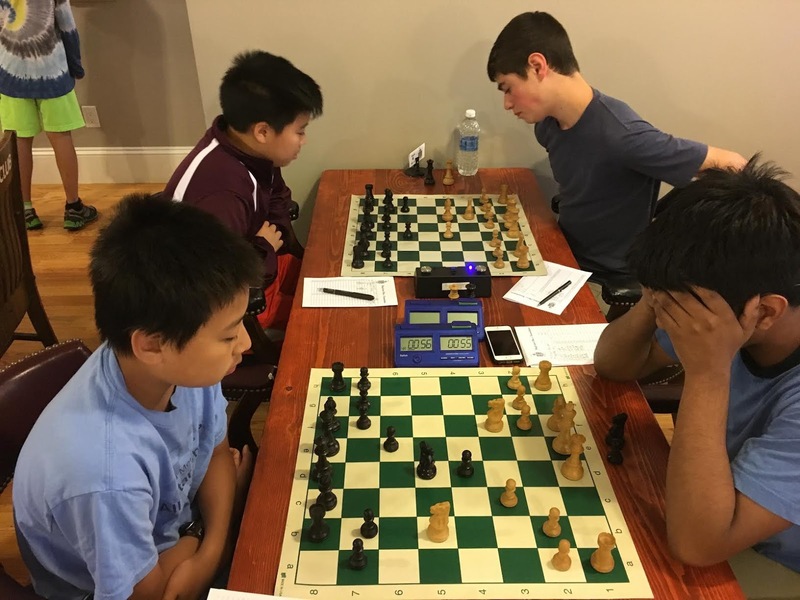 Aravind finished with 5 points to share 3-5th place. 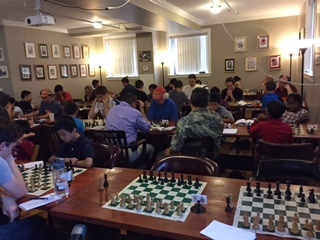 tense, complex endgame, vs NM Chris Williams. Lawrence Tu plays Thomas Ha, Round 5: 1-0 ! Lawrence finished with 4 points for a +16 to 1717 rating! 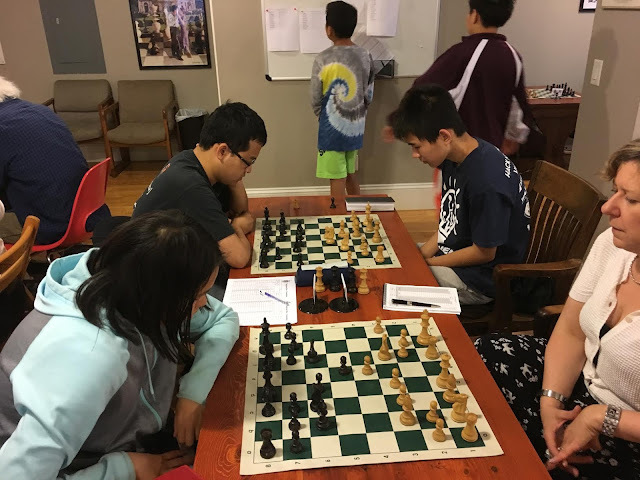 Lydia Shen, black vs David Martin, Round 7. Lydia scored 3 points for a +97 to 1480 rating! all grown up now and studying physics at UMass, Amherst. Description Open to players rated at least 2000 on the July or August supplement or live MSA rating. Note: This is not the Senior Championship. That is completed. This is a new event, a regular one-day Senior Sunday. 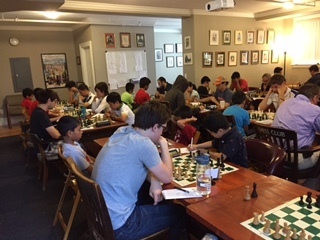 We had a wonderful 50+-player event this past Saturday, and I thank all the players who participated with great enthusiasm. The room was full, but we had just enough room for everyone. I appreciate all the help I've had from Bernardo, Natasha, Dave, and Andrew in becoming familiar with the workings of BCF bit by bit. 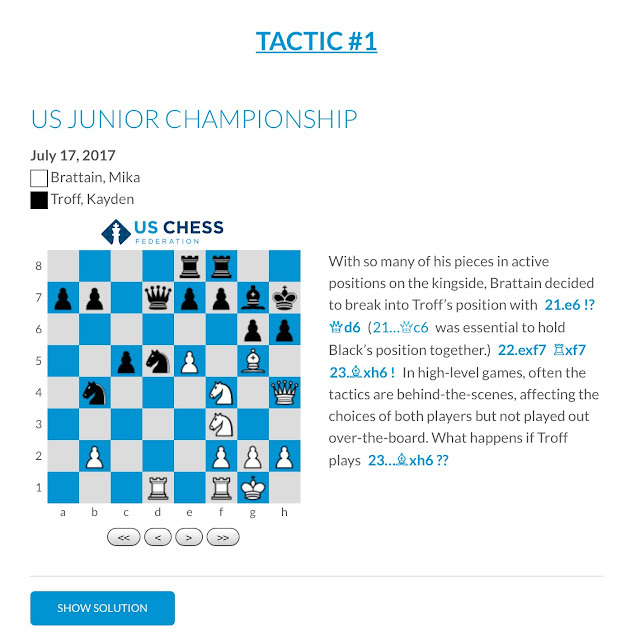 The tournament crosstable is up on the BCF website. Looking forward to many more 50+ player events. 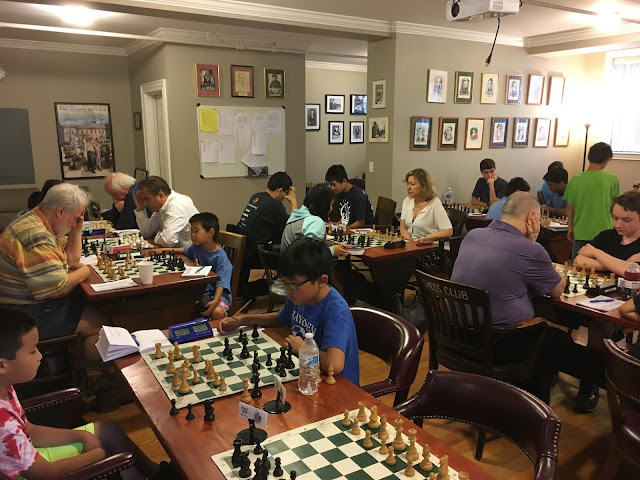 Thanks to the group of kids, some of whom were new to chess tournaments, who came to play in the BCF July Scholastic, and thanks to all the parents. As of this writing, the final results have not been published. This was my second Scholastic at Boylston Chess Club, and I thank Andrew Hoy for the opportunity to supervise this excellent event. I'll be back again for the August Scholastic and hope to see these kids back again. 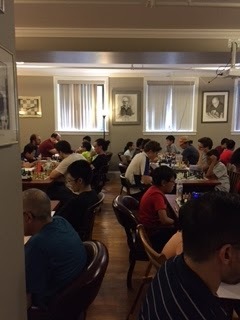 The July $15 Open was another big success - a good turnout - 51 players. Bernardo Iglesias, who also took the photos below. Entry Fee For 6 rounds: $70, $40 for BCF members; For 3 rounds: $35, $20 for BCF members. All: $5 more at door. 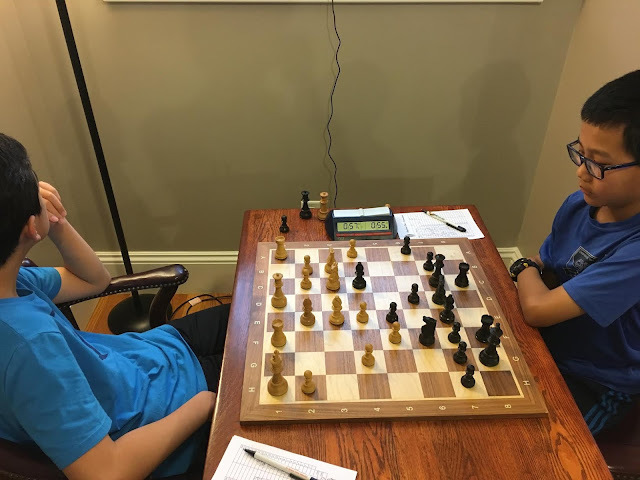 Mika Brattain’s excellent opening preparation against Troff gave him a comfortable initiative, which he pressed to his first victory of the tournament. When I arrived at the board, my young opponent Andrew, whose legs didn't reach the floor from the chair, was slumped over the board. Asleep? No. Tactically asleep? Hopefully. He's not going to blunder with 5...Bb7? ?, is he? Yes, he is! After 6 Nxe5, I was up a clean, no strings attached, pawn. 24 Rc2?? I think at this point I had seen Black's next move coming (24...Rxc5, to be followed by 25 Rxc5 Bd4+ and 26...Bxc5), but I was too flustered, feeling time-pressured, to find 24 Ne7!, when White is still winning (+-). I may be giving myself too much credit, but I think that if the time control had been slower (maybe even just the 40/100, G/60 of the last three rounds), I would have seen the right move. By forking the two rooks, White ensures he will get back the exchange that he'd lose to Black's bishop after 24 Ne7 Bxc1. If, after 24 Ne7, 24...Nb7, then 25 b4 +-. Whenever I’m about to do something, I think, 'Would an idiot do that?' And if they would, I do not do that thing. 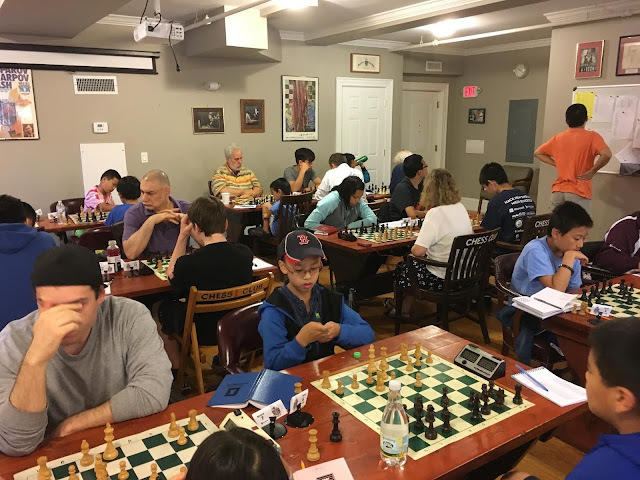 Here, I played 28 bxc5+? ?, failing to notice that 28 Rd1! would have avoided losing a piece. I was, quite unreasonably, still psychologically rocked from not having foreseen the 24...Rxc5 and 25...Bd4+ moves earlier in the game. Eventually, 0-1, with me playing the last moves quite quickly, illogically worried about losing on the clock after having already gotten a lost position on the board. Probably part of me just wanted the end to arrive more quickly. Of course, that doesn't mean I know it well. Years ago, I bought a used, marked-up Cambridge Springs book online. I was not deterred by the markings which the seller had noted, although I didn't know their full extent until after I received it. The book was expensive, and I stubbornly refused to pay full price. These are not my markings, but my approach is similar: I play through the variations, assessing, based on my own personal style, how I feel about them, then write in my preferences so that I can more easily find my known preferences later (often enough, long years later). Unfortunately, that is not a task that I'd gotten around to for this opening variation prior to this game (Hmm, still haven't gotten around to that...). My young opponent Amy seemed a bit surprised by 6...Qa5, suggesting a lack of familiarity with the position. 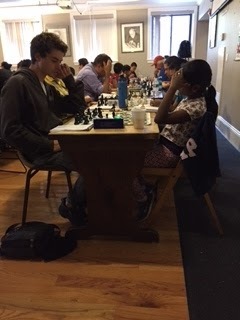 After some thought she played 7 Bxf6. 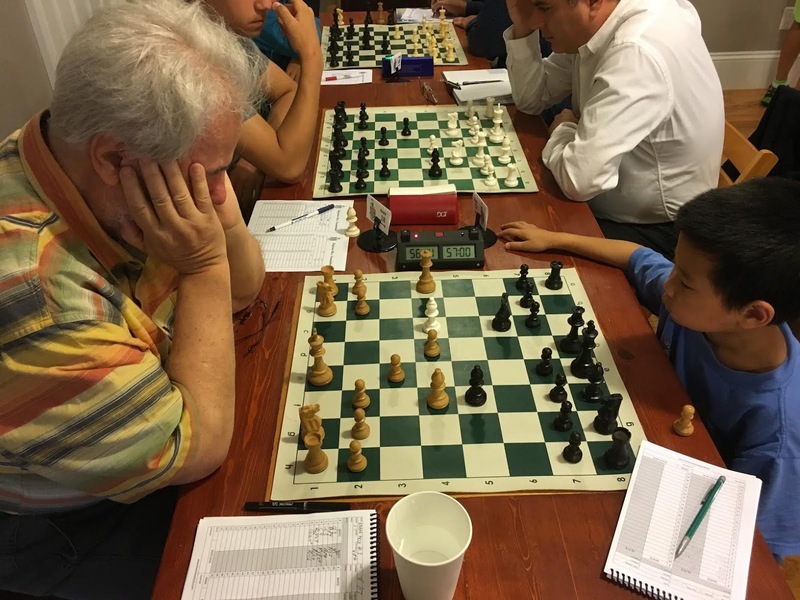 Ken seemed a bit surprised by 7 Bxf6, suggesting a lack of familiarity with the position. Let me tell you, G/45, d5, is *not* when you want to be chewing up precious minutes contemplating at length which of several broad strategies are appropriate for your position, but that's exactly what I found myself doing. I was rapidly smothered, and resigned without much ado. I suspected, but couldn't remember, if 3...Nxe4 was valid. Bologan calls this Zukertort's Strike in Black Weapons in the Open Games. After 5 Nxe4, Bologan (Did I earlier mistype that as Bologna, or did autocorrect do that?) gives a number of lines beginning with 5...d5. Naturally, I didn't remember them, and couldn't realistically expect to work them out myself in this time control, and I also didn't want to get blown out of the water by known opening tactics, so I played the timid 5...Be7, and aimed to make the best of things. 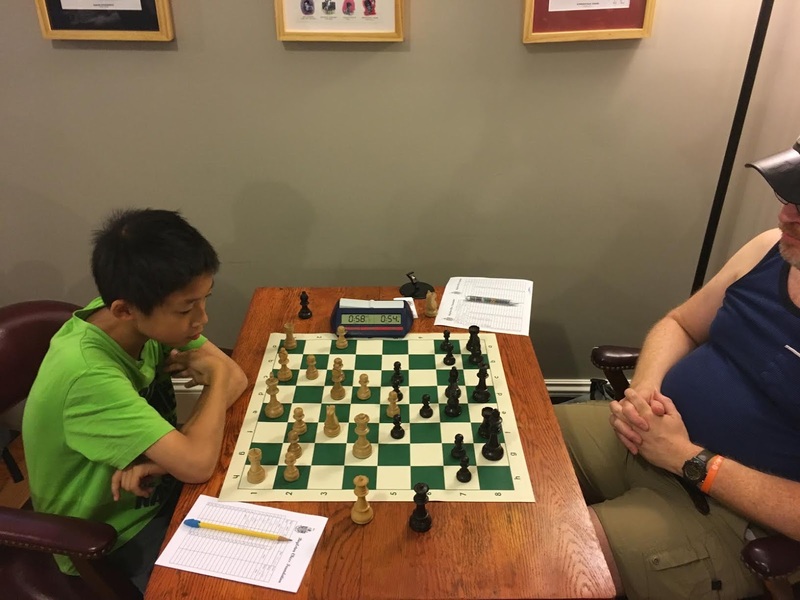 My opponent Noah also played less than aggressively, then after a time scramble (no surprise there! ), I won the ending. Noah is older than I, so I guess this win still fits under "No country for old men."